Map of Park & Ride lots in El Dorado, Yuba, Yolo, Placer, Sacramento and Sutter counties. 511 Most Park and Ride lots in the region provide free parking for drivers throughout the region to meet carpool or vanpool partners, or ride public transit. American River Bike Trail, Davis, City of Elk Grove, City of Folsom, City of Roseville, Sacramento County, Yuba City, and more. Local agencies and bicyclists provide up-to-date bicycle maps and route conditions. Trips can be planned to be most direct or most bike friendly. How to dress. What equipment you need. Rules of the Road. How to choose a commute route. Right click on the guide and save it to your desktop. Then open it with Adobe Acrobat. 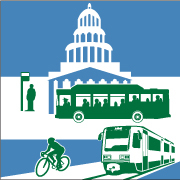 The California Bicycle Coalition is a statewide nonprofit advocacy and education group of individuals, organizations, clubs and businesses advocating for safer, healthier, more livable communities through bicycling. SABA works to maintain, improve and expand bikeways, improve bicycle access, increase cycling safety through education, enforcement and hazard removal, get lockers and showers and workplaces and bike parking everywhere it is needed and to create a regional network of bike trails. With a current membership of 300,000 affiliated cyclists, including 25,000 individuals and 700 affiliated organizations, the League works through advocacy and education to promote bicycling for fun, fitness and transportation. Sacramento current air quality conditions, Air Quality Index, Health effects, Things to do to help improve the air quality. The District website provides information, newsletters, publications, rules, regulations and plans for improving regional air quality. Breathe California of Sacramento – Emigrant Trails is dedicated to healthy air and preventing lung and other air-pollution related diseases by partnering with youth, advocating public policy, supporting air pollution research, and educating the public. In the Urban Cycling Skills class, you'll ride on the street with traffic, learning where to ride safely, how to be visible and predictable to motorists and where to position yourself at intersections. Off street, you'll practice Hazard Avoidance Drills and in the classroom, you'll watch a video, put it all together, learn the rules of the road and basic maintenance.